Wikipedia is not a trusted source, as it can be edited by anyone. Different more trusted sources say otherwise, that this tank is indeed a tank destroyer, but the same goes for the opposite. I think we should ask Altank, who is Swedish himself and a big fan of tanks and military stuff. However, please, ensure to create topics in the appropriate (sub)sections of the forum, in this particular case, in the "NATO (North Atlantic Treaty Organization) Units" section, belonging to the "In-game Vehicles Area" of the forum, as clearly stated in the current administrative guidelines concerning the forum structure. Repeated failure to abide by these guidelines will be considered as trolling and we will therefore act accordingly, resulting in moderating measures being undertaken. The topic has been moved to the appropriate section of the forum. Let me guess, Greenoak is the "few people"? 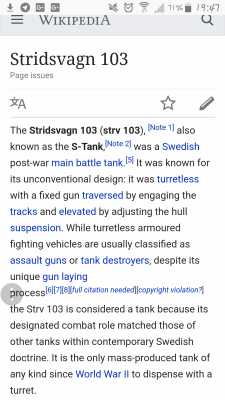 The STRV 103b is refered to as a Main Battle Tank solely for the reason that it performs the same roles as other Main Battle Tanks; this doesn't mean as effectively. If it weren't for the Swedish doctrine, it would be refered to as a Self-Propelled Tank Destroyer because of a variety of reasons. Firstly, it's turretless design, with the gun mounted in the hull is a common factor of design for any given Tank Destroyer; there are an array of turreted Tank Destroyers, but, most are usually restricted in their traverse or have other factors that influence the fact that they are Tank Destroyers. Secondly, Main Battle Tanks or MBT's are tasked with performing on the front-line, usually fully exposed, in 1 verses 1 combat; whereas Tank Destroyers are second-line supporters, known for their high-powered or high-velocity, high-penetration guns; their concealment; and their lack of armor or over-abundance of armor, such that they're impractical for constant moving. The STRV shares all these traits, it equips with the 90mm,105mm, or 120mm smooth bore guns, it's low-sillouette makes it easy to camouflage in rolling hills (much like that of Sweden) and it lacks armor, making it less than adequate for close-quarters tank on tank combat; not to mention it's lack of a turret makes it less than useless in close-proximity fighting, as it is easily flankable. Conclusively, you can argue that the STRV 103b is a Main Battle Tank because of how they're used by their crew in combat, but, I believe they're almost less than adequate enough for the MBT status, as, it's obsolete to any other turreted MBT out there in today's world. Hence Sweden now uses the Leopard 2, which they imported from Germany in 1977 and upgraded to the Stridsvagn 122. Thank you for listening. And yet, all that reasoning for nothing. 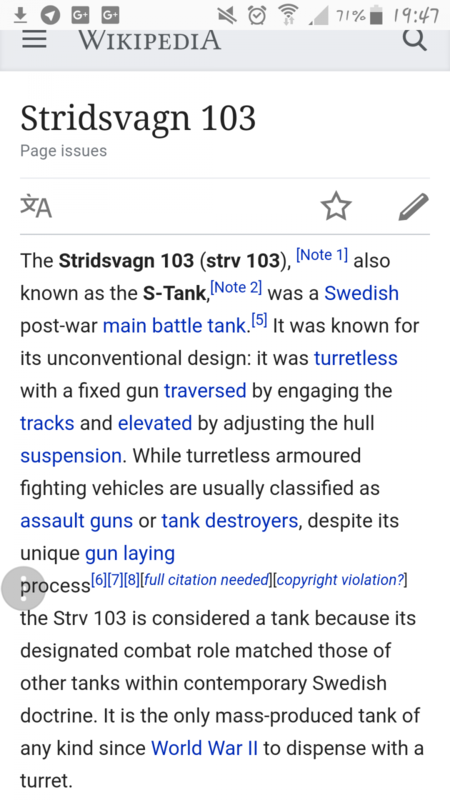 It's a swedish tank, and they classified it, how they classified it. As an MBT. Not that I know anything, but I have like 10 tabs open on this thing. And tho a lot of talk about how it should be classified, they also say how it is. And I guess definites are better..
People can call it an MBT all they want, for whatever reasons they have, but, everything about it still strongly indicates it's a Self-Propelled Tank Destroyer. It's only classified as an MBT because the Swedish designated it that role; and, I'm telling you, the Swedish Doctrine was wrong. 1. When (some)people think "Main Battle Tank" the first tank that will pop into their head will most likely be the U.S. M1 Abrams, the British Challenger 2, French AMX5-56 Lelect, and the German Leo 2, or some other "modern" tank that is equipped with a turret. 2. It fills the role of the TD very well. The Swedish high command knew that they were more likely to be attacked, then attack so they designed their new MBT to fill a defensive/ambush role. small size, good gun, and well protected. The STRV 103 B filled that role perfectly. 3. It's simply not that well known. It lives in the shadow of it's larger cousins from other nation, hell it was replaced by (I think) the Leo 1, and later Leo 2 which both have turrets. That is simply my opinion and I could be 100% wrong. Because Swedish designers have been making MBT. Edited by FieldMarshal, 06 November 2017 - 11:56 AM.